Not to be confused with Merrimack County, New Hampshire. Merrimack is a town in Hillsborough County, New Hampshire, United States. The population was 25,494 at the 2010 census, and an estimated 25,660 in 2017, making it the ninth-largest municipality in New Hampshire. There are four villages in the town: Merrimack Village (formerly known as Souhegan Village), Thorntons Ferry, Reeds Ferry, and South Merrimack. The first known settlers of the area appeared sometime after the last ice age. Merrimack is a Native American term meaning sturgeon, a type of fish. The Pennacook people named the Merrimack River after this fish because of the vast population that once existed there. The Penacooks spelled it Monnomoke or Merramake. "When the town was incorporated, it took the name of the river and spelled it Merrymac," according to the Merrimack Historical Society. The first mention of the territory containing the current town of Merrimack among written records was the petition of Passaconaway to the General Court of Massachusetts for a grant of land to include a part of this region. This was in 1662, and in the autumn of that year the court acceded to the request, and the aged sachem and his associates were granted a strip of country a mile and a half wide on both banks of the Merrimack at this section of the river. Although the boundaries of this grant are not specifically known today, it is probable that the chieftain held at least a portion of the current town of Merrimack. European settlers first came to the area in the late 17th century when the area was still in dispute between the Province of New Hampshire and Massachusetts Bay Colony. The town of Merrimack was originally part of the 1673 Dunstable grant. In 1734, Massachusetts granted the town organization as Naticook, which was made up of Litchfield and part of Merrimack. In 1746 the boundary line between Massachusetts and New Hampshire was revised, and the land which was originally part of Massachusetts became part of New Hampshire. On April 2, 1746, Governor Benning Wentworth signed a charter establishing that the land from Pennichuck Brook to the Souhegan River became the Town of Merrymac. At that time fewer then 50 families lived here. Pawtucket, Nashaway and Pennacook people camped along the banks of the Merrimack and Souhegan rivers. The Pennacooks were greatest in numbers, and their chief, Passaconaway, was the ruler of all the tribes in the Merrimack Valley. On June 5, 1750, the town's charter was ratified, giving the town an additional 3 miles (5 km) to the north. The new portion called "Souhegan East" was made up of the land north of the Souhegan River. Matthew Thornton, a signer of the Declaration of Independence, lived and was buried in Merrimack. The Signer's House and Matthew Thornton Cemetery are still located in the town. The original meetinghouse was built at the exact center of town. There were two cemeteries. Turkey Hill on Meetinghouse Road is the first mentioned in the town records, but Thornton Cemetery on Route 3 has the oldest gravestone. The nineteenth century saw much growth in Merrimack. The meetinghouse was too small and too far from what had become the center of town. The church and government became separate and two new churches were built in more convenient locations, one in South Merrimack and one on Baboosic Lake Road. A new town hall was built to replace the meetinghouse. The Boston and Maine Railroad laid tracks through the town in the 19th century, with several stations operating until the mid-20th century, when the advent of the automobile transformed Merrimack from a largely agricultural community to a bedroom community of Boston and nearby cities in New Hampshire. Since 1970 the town has been the home of an Anheuser-Busch brewery, their easternmost, and one of their smallest plants in the United States. It is home to a brewery tour and one of the five stables for the Budweiser Clydesdales. The Merrimack School Board attracted national attention in 1995 when it passed a "prohibition of alternative lifestyle instruction" act, which resulted in the removal of a work by William Shakespeare from the school curriculum. The board members who supported the act were voted out in the subsequent board election. According to the United States Census Bureau, the town has a total area of 33.4 square miles (87 km2), of which 32.6 sq mi (84 km2) is land and 0.8 sq mi (2.1 km2) (2.48%) is water. The highest point in Merrimack is an unnamed hill in the northwestern part of town that reaches 512 feet (156 m) above sea level. Shadows of the former villages that now make Merrimack still exist. However, the boundaries and exact definitions are unclear due to the expansion of suburban development in the town during the latter half of the 20th century. The area of town near Naticook Lake and Continental Boulevard, the name of this area comes from Matthew Thornton, one of the signers of the Declaration of Independence who lived in Merrimack and is now buried in a cemetery near the intersection of Daniel Webster Highway (U.S. Route 3) and Greeley Street. Thorntons Ferry Elementary School is located on Camp Sargent Road. The northern portion of the town, Reeds Ferry is centered on the current intersection of Bedford Road and Daniel Webster Highway. The boundaries of the area are unclear, as the northwestern part of town near Baboosic Lake is not traditionally considered a portion of Reeds Ferry. While as a defined village it was located mostly near the Merrimack River, the area near Baboosic Lake may now possibly be seen as part of Reeds Ferry. Reeds Ferry Elementary School is located on Lyons Road. Centered on Pennichuck Square on Rte. 101A and Continental Boulevard, South Merrimack is usually considered to be the southwestern part of town near Rte. 101A and Boston Post Road. However, the southeastern portion of town near Harris Pond might also be considered part of South Merrimack or Thornton's Ferry. The center of town is not known as "Merrimack Village" per se, but constitutes the area between the more defined Reeds Ferry and Thorntons Ferry areas. Largely considered to be located at the Public Library on the corner of Baboosic Lake Road and Daniel Webster Highway, Merrimack Village was built along the Souhegan River that roughly cuts the current town in half. The elementary school in this part of town is named after James Mastricola, who deeded the land to the town upon his death. One of the three elementary schools, the upper elementary school, Merrimack High School, the library, and the current town hall, among other buildings, are all located on the land formerly owned by Mastricola. The "village" is considered to extend westward to the Amherst border. This is due in large part to the former Town Meetinghouse, which was located on the corner of Turkey Hill Road and Meetinghouse Road. For additional demographics on the area of Merrimack east of the Everett Turnpike, see East Merrimack, New Hampshire. As of the census of 2010, there were 25,494 people, 9,503 households, and 7,150 families residing in the town. There were 9,818 housing units, of which 315, or 3.2%, were vacant. The racial makeup of the town was 95.0% white, 0.8% African American, 0.2% Native American, 2.0% Asian, 0.02% Native Hawaiian or Pacific Islander, 0.5% some other race, and 1.6% from two or more races. 2.1% of the population were Hispanic or Latino of any race. Of the 9,503 households, 36.7% had children under the age of 18 living with them, 62.6% were headed by married couples living together, 8.5% had a female householder with no husband present, and 24.8% were non-families. 18.8% of all households were made up of individuals, and 5.7% were someone living alone who was 65 years of age or older. The average household size was 2.67, and the average family size was 3.06. In the town, 24.5% of the population were under the age of 18, 6.7% were from 18 to 24, 25.7% from 25 to 44, 32.7% from 45 to 64, and 10.3% were 65 years of age or older. The median age was 40.7 years. For every 100 females, there were 99.0 males. For every 100 females age 18 and over, there were 96.4 males. For the period 2011-2015, the estimated median annual income for a household was $90,708, and the median income for a family was $101,786. Male full-time workers had a median income of $69,937 versus $50,184 for females. The per capita income for the town was $39,695. 4.0% of the population and 2.3% of families were below the poverty line. 4.7% of the population under the age of 18 and 4.4% of those 65 or older were living in poverty. PC Connection and Brookstone are based in Merrimack. Merrimack Canoe Company was started in Merrimack before being relocated to Tennessee. Other notable employers include Fidelity Investments, Anheuser-Busch, Campers Inn, and BAE Systems. Opened in 2012, the Merrimack Premium Outlets are a 560,000-square-foot (52,000 m2) retail mall area with 12 buildings, parking lots, and other site improvements located off exit 10 of the Everett Turnpike. The six public schools in Merrimack are managed by the Merrimack School District and include Thorntons Ferry Elementary School, Reeds Ferry Elementary School, James Mastricola Elementary School, James Mastricola Upper Elementary School, Merrimack Middle School and Merrimack High School. Merrimack High School has won one state championship in baseball (2007), three in softball (1980, 1988, 2001), one in football (1987), two in soccer (1998 girls, 2007 boys), three in indoor track (1999, 2007, 2008), four in outdoor track (2003, 2004, 2006, 2007), one in cross-country (2006), one in girls lacrosse (2012), one in skiing (1979), two in volleyball (2001, 2014), and four in basketball (1967, 2003, 2004, 2012). The Academy for Science and Design was a charter school established for the 2007-08 academic year; it was New Hampshire's first charter school to concentrate on science, math, engineering, and design and is free of tuition fees. The school has since moved to Nashua. In 2014, the Gate City Charter School for the Arts opened its doors to students. The Nashua West Rotary club is responsible for the annual Rock'N Ribfest, proceeds of which benefit many local charities. The Ribfest has been held on the Anheuser-Busch grounds in Merrimack since 2003. This family-oriented event features BBQ, children's games and activities, plus music and other entertainment. The next Ribfest will again be held on Father's Day weekend, Friday June 15 through Sunday, June 17, 2018. As a large, suburban community located directly between the state's two largest cities, Manchester and Nashua, Merrimack plays a disproportionate role to its size every four years in the New Hampshire primary; in almost every Fourth of July preceding a presidential election, every presidential candidate will march or have a float in the town's Fourth of July parade. Traditionally, in state and national politics, the town has been dominated by Republicans, who currently hold seven of the town's eight seats in the General Court. The current General Court district of Merrimack is Hillsborough 19. The town government consists of a 7-member Town Council. This form of government was recently adopted by a ballot measure on May 25, 2006. More information on Merrimack's government can be found at Charter commission website. Each March, the town conducts two deliberative sessions (school and general) to decide what warrant articles will be on the Town General Election ballot in April, one of which is always election of town officers, and another is the budget. If the budget is not approved by the voters, the town's governing council either holds an emergency hearing regarding a new budget or goes forward with the priors years' budget, amended with any time sensitive information pending upon the current year. The Merrimack Village District administers the water system that serves the central area of the town. 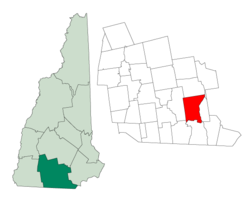 ^ "Town of Merrimack, New Hampshire". Town of Merrimack. Retrieved July 19, 2018. ^ "Anheuser-Busch Factory Tour in Merrimack, NH". factorytour.com. Retrieved July 5, 2010. ^ Mark Walsh (February 28, 1996). "Gay Students' Request Spurs Board To Cut Clubs". Education Week. Retrieved April 7, 2009. ^ "A History of James Mastricola Elementary School". Mastricola Elementary School. Archived from the original on 2007-09-30. Retrieved 2008-03-13. ^ a b c "Profile of General Population and Housing Characteristics: 2010 Census Summary File 1 (DP-1): Merrimack town, Hillsborough County, New Hampshire". American Factfinder. U.S. Census Bureau. Retrieved November 1, 2017. ^ "Selected Economic Characteristics: 2011-2015 American Community Survey 5-Year Estimates (DP03): Merrimack town, Hillsborough County, New Hampshire". American Factfinder. U.S. Census Bureau. Retrieved November 1, 2017. ^ "Update on Merrimack Premium Outlets". Town of Merrimack. April 2008. Retrieved December 14, 2011. ^ "Academy for Science and Design - Contact Us". asdnh.org. Retrieved 8 April 2016. ^ "1892 Map of Merrimack, NH". Retrieved April 18, 2019. ^ "Tim Schaller". friars.com. Retrieved April 18, 2019. ^ "Forrest Percival Sherman". ArlingtonCemetery.net. Retrieved April 18, 2019. Wikivoyage has a travel guide for Merrimack.